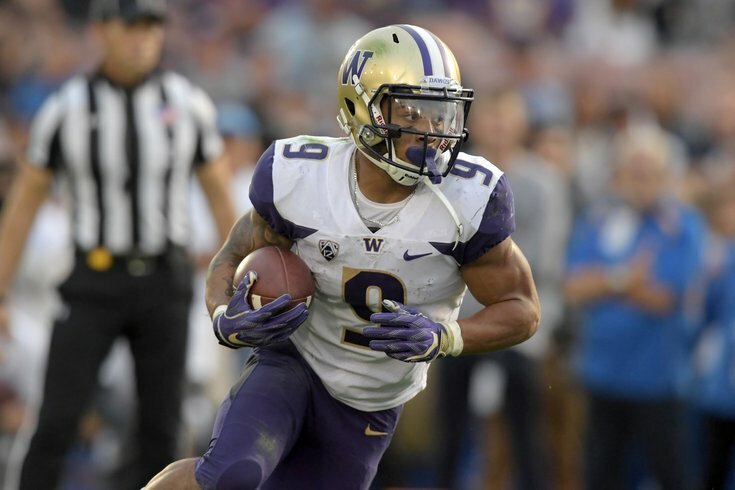 Washington running back Myles Gaskin has some of the same traits as Darren Sproles, most notably pass protection skills. The college football season is in full swing, as we are now into the eighth week of a full slate of games. Kavontae Turpin, WR/KR/PR, TCU (5'9, 157): (11) Oklahoma at TCU, 12:00 p.m.
Turpin is also a receiver with home run hitting ability, though he's going to face questions about his size, at 5-foot-9, 157 pounds. A creative offense can find ways to use his skills, but he's unlikely to be an every down type of receiver at the next level. The Eagles have noticeably lacked a quality returner both on kicks and punts the last two season whenever Darren Sproles has been out. Turpin could fill both roles, and would be appealing in the later rounds. Christian Wilkins, DT, Clemson (6'4, 300): (16) NC State at (3) Clemson, 3:30 p.m. The Clemson defensive line is absolutely loaded with NFL talent (we already profiled Clelin Ferrell and Dexter Lawrence), and Wilkins will be a high pick as well. Wilkins' primary position is at defensive tackle, but he also has extensive experience playing on the edge at defensive end, as you'll see in the following video. Typically, it's defensive ends who can kick inside to defensive tackle, not the other way around. Wilkins has even played some safety (!). OK, so not really. Anyway, the Eagles already have a major need at defensive tackle, and they will also soon need help at defensive end, as Chris Long and Michael Bennett are nearing the end of their careers. Wilkins is an athletic, disruptive interior player with some nice versatility. Isaiah Buggs, DT, Alabama (6'5, 286): (1) Alabama at Tennessee, 3:30 p.m.
Like Clemson, Alabama is loaded along their defensive line, like they are every year, churning out an absurd number of NFL defensive linemen. In the last three drafts alone, Alabama has had seven defensive linemen selected, and that doesn't even count their edge rushers. Five of them went in the second round or higher. Raekwon Davis (previously profiled here) will go in the first round if he comes out, barring any unknown character or medical issues. Buggs likely won't go quite that high, but he's going to be playing in the NFL. Buggs, now a senior, was a JUCO transfer who is in his second season at Bama. He is currently fifth in the nation (first among defensive tackles) with 7.5 sacks. Buggs is athletic and strong, and could do some damage playing next to Cox on the interior of the Eagles' D-line. Also, if the Eagles want to revive their basketball team, he can play a little point guard. Myles Gaskin, RB, Washington (5'10, 193): Colorado at (15) Washington, 3:30 p.m.
Gaskin is already Washington's career leader in rushing yards and touchdowns. He is a smooth runner with good lateral quickness, and while he doesn't have much in the way of receiving numbers, he has shown that he is a good at catching the football. Where Gaskin really stands out, however, is in pass protection, where he is outstanding. The pass protection traits, as well as Gaskin's all-around skills should appeal to the Eagles as a replacement for Darren Sproles. Connor McGovern, OG/C, Penn State: (18) Penn State at Indiana, 3:30 p.m.
McGovern has been a starter along the PSU OL since he was a freshman. He played left guard initially, then played center for a year and a half, and now he's the starting right guard. Stefen Wisniewski's demotion to the bench signals that this will likely be his last year in Philly. Wisniewski is signed through the 2019 season, but if the Eagles were to cut or trade him, they would save $3 million. McGovern is a guy who could provide depth at all three interior OL spots before eventually growing into a starting role.